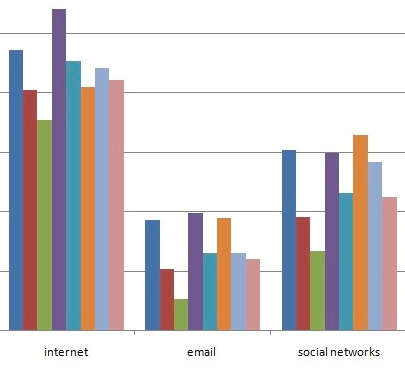 The Bar chart (above) expresses how often students reported that they were 'addicted' to media. Click on it to go to a full graphic. ‘Addiction’ is a physical need: Students across the dozen participating universities reported an unexpected phenomenon: they not only missed the ‘functions’ of the media – the delivery of news and information – but they physically craved the actual devices themselves. Students reported emotional symptoms of their ‘addiction’ to media: Students from every country wrote about how going 24 hours without media affected their emotional well-being. Even some of those who found benefits in unplugging – fewer distractions, face-to-face connections with friends and family – likened their reactions to the media fast to feelings of a drug withdrawal. They became anxious, stressed, jealous, hostile. UK: “The only feeling I can relate to giving up my phone and Twitter is that of giving up smoking. When I gave up smoking and I saw others smoking, I felt as though I was missing out on something. During the 24 hours of the experience I actually craved having my phone, and routinely checked my pockets for it every 5 minutes. UK: “My experience taught me of the dangers of my addiction to media. The struggle I had, especially in the first few hours when I was on my own, could be described in the same terms as an addiction to alcohol. If I’m considered to be a typical media consumer, then it shows how media shapes our society consistently. Even actions such as eating breakfast had been shaped to such an extent that I was almost distressed when I couldn’t read the news. UK: “It’s like some kind of disorder, an addiction. I became bulimic with my media; I starved myself for a full 15 hours and then had a full on binge. Emails, texts, BBC iPlayer, 4oD, Facebook… I felt like there was no turning back now, it was pointless. I am addicted, I know it, I am not ashamed. The need for media is tangible: Students’ repeatedly called the level of their (and their friends’) dependence on media ‘scary.’ Said one student based in China: “This is very scary. We are too dependent on it,” while a student from a U.S. university noted “After experiencing this dreadful 24-hours, I realized that our obsession with media is almost scary. I could not even begin to imagine the world if it was media-free.” And students around the world noted the unsettling realization that they had an almost irresistible urge to touch the devices that had been declared off-limits for 24 hours. Lebanon: “It was not the television that I needed, since I don’t watch much television anyway, it was not the internet that I wanted either or to make phone calls, but it was more about a means of practice that I was so used to. I was used to having the television on even if I was not watching the television, my Facebook was always on even if I was not at my laptop, and my phone was always in my hand even if I didn’t use it. I knew I was addicted when… Students often began their narrative of their day without media by admitting as a matter of fact to their dependency on media – especially their mobile phones. They then followed by documenting when they realized exactly how dependent on media they actually were, and by recording the symptoms of their ‘addiction’ to media. NB: The researchers of this Unplugged study are not health care professionals trained in the diagnosis and characteristics of addictions or depressions, and this study was not intended to assess students’ mental or physical well-being. The researchers do note, however, that many students employed the rhetoric of addiction, dependency and depression when self-reporting their reactions to going unplugged for 24 hours, and that many students also reported both mental and physical symptoms of distress.